Who doesn’t love a dinner that you can make with just 4 ingredients? 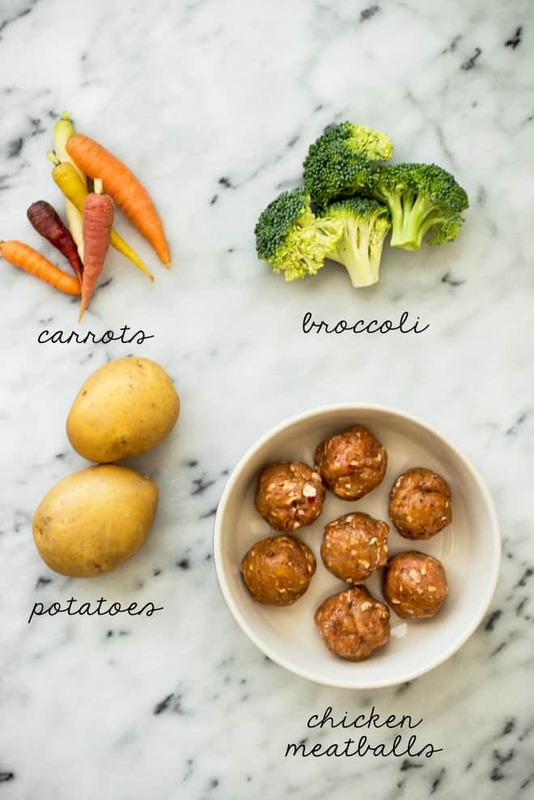 I’m pairing chicken meatballs with my favorite roasted potatoes, broccoli and carrots. Minimal prep required! Okay, friends, welcome to my first budget dinner post! Each week, I’m posting at least one dinner recipe that costs under $25 to make. Actually, most of them should be under $20, but I’m giving myself some wiggle room in case I want to feature more expensive ingredients, like seafood. 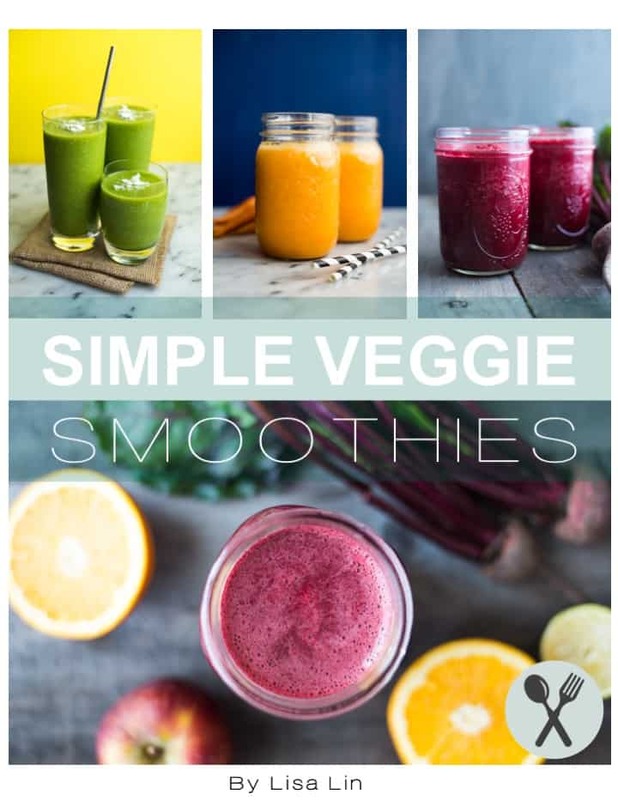 I am getting positive feedback on the idea, so I hope you enjoy these recipes! Here’s a dinner that I whipped up a few weeks ago. I bought raw sausage that my local co-op makes in the store and I chopped it up into 1-inch pieces. I then removed the meat from the casing and shaped the meat into meatballs. This is what i do when I’m too lazy to make meatballs from scratch, which is quite often, I might add. While the chicken sausage is great, the real star of the show are the potatoes! My word, I LOVE roasted potatoes. My mother-in-law makes the best ones—extra crispy on the outside and soft on the inside. However, they usually take about an hour to make, and I ain’t got time for that on a weekday! So here’s what I do for weeknight roasted potatoes. Start by roasting the potatoes in the oven first. They’ll need extra oven lovin’ to get them nice and crispy. The rest of the ingredients will come in later. 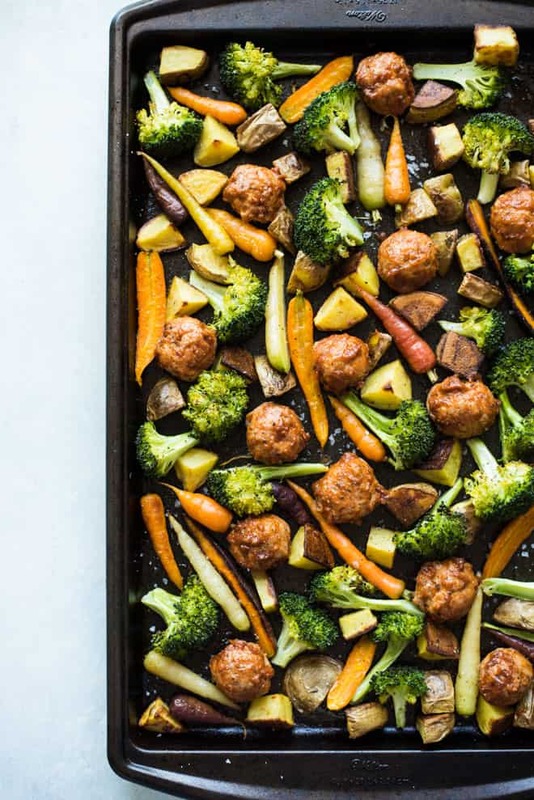 This sheet pan dinner is constantly on repeat at my house now because my husband loves it so much! Meat and potatoes, what can you say? By the way, aren’t those baby carrots cute? Use 2 pans for roasting: I highly recommend using 2 pans for roasting this, even if you can fit everything into one pan. The extra room gives the vegetables space to breathe and caramelize. 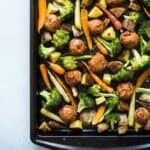 If you jam the vegetables too closely, the vegetables will start steaming instead of roasting. Finishing the meatballs with sauce: The meatballs looked quite naked once they were done cooking, so I brushed a bit of my enchilada sauce all over them. You can also use pasta, marinara or teriyaki sauce, too. Baking time for the potatoes: If you want really dark brown and crispy potatoes like the ones in my photos, roast them for 25 minutes before adding the other ingredients. Otherwise, stick to 20 minutes for golden brown potatoes. 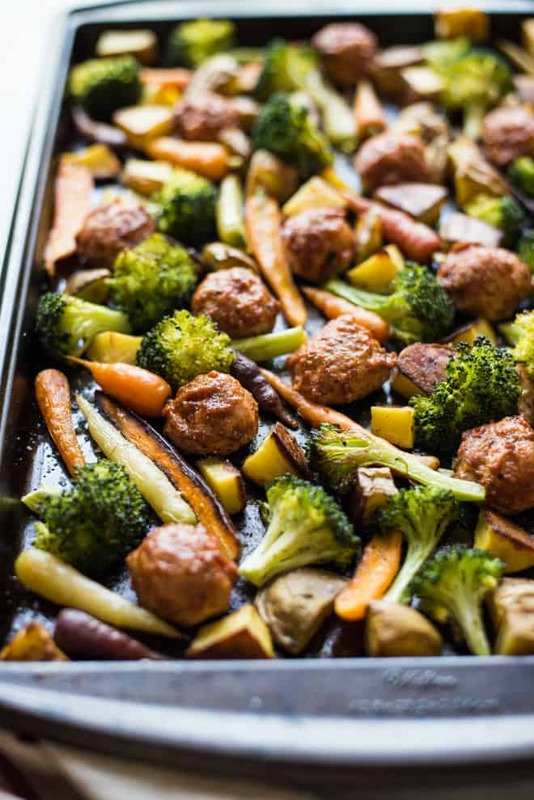 Save time on cleaning: Lining the sheet pans with parchment paper before roasting everything will help save clean-up time because the food won’t stick to the pan. For the purposes of taking better looking photos, I roasted everything directly on the sheet pans. I greased the pans so that the meat and vegetables won’t stick as much. Preheat oven to 400ºF (205ºC). Slide oven racks into the upper and lower third positions. Grease 2 rimmed baking sheets with 2 teaspoons of olive oil on each pan. Alternatively, you can line both baking sheets with parchment paper. You wouldn’t need to grease the parchment paper. If you are using raw or cooked chicken meatballs, set them aside. If you are using raw chicken sausage, chop them into 1-inch chunks. I like digging the ground meat out of the casing and shaping the meat into meatballs. Chop broccoli browns in to florets. Slice carrots into 1/4-inch thick sticks that are about 3 or 4 inches long. You can also use baby carrots for this. I recommend slicing the thicker carrots in half. Chop potatoes into 1/2-inch chunks. Toss potatoes with 1 tablespoon of olive oil and a generous pinch of salt. Spread the potatoes over the 2 baking sheets. Slide the baking sheets onto the upper and lower third oven racks and bake potatoes for 20 to 25 minutes. Toss broccoli florets with 1 tablespoon of olive oil and a pinch of salt. In a separate bowl, toss carrot sticks or baby carrots with 2 teaspoons of olive oil and a pinch of salt. Remove baking sheets from the oven and season everything with salt and pepper to taste. Brush some sauce on the meatballs, if you like. If you are using cooked meatballs, just bake them for 10 minutes instead of 15. This sounds like a delicious recipe. You mention chicken sausage in the instructions, but not in the ingredient list. 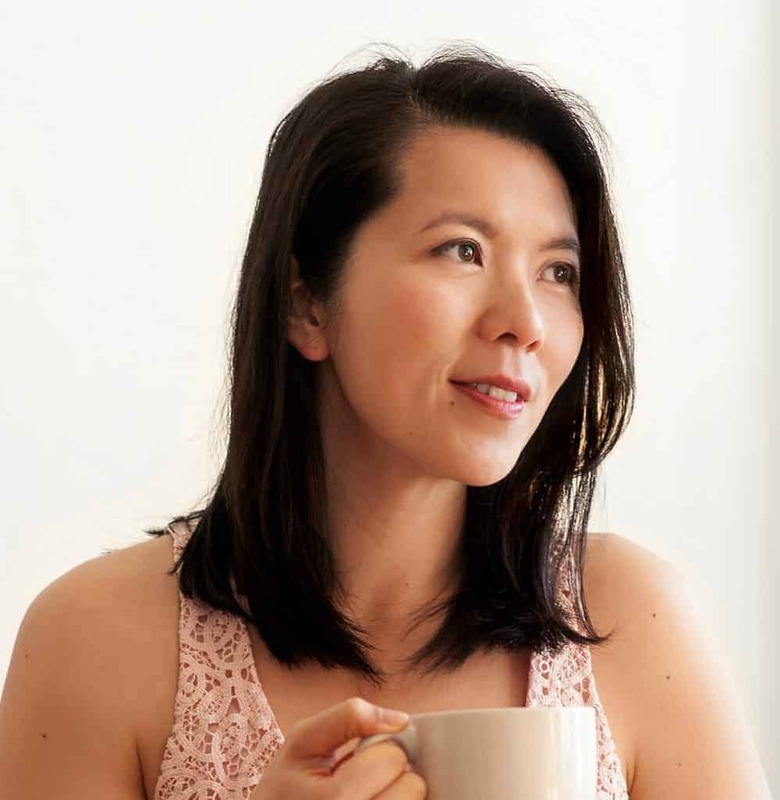 Also, do you have a chicken meatball recipe that you can link to? Can you clarify? Thanks! Sorry for the confusion, Kathy! I have changed the ingredients and directions a little to be more clear. Essentially, you can use 1 pound of raw chicken sausage, chop it into chunks, and shape the meat into meatballs. Alternatively, you can use raw/cooked chicken meatballs. Pre-cooked meatballs don’t need that much time in the oven. I am working on a meatball recipe right now, so hang tight! I love this idea! I’m looking forward to the budget dinner posts to come! If you could suggest a pasta sauce that would blend well with this what would it be? Hi, Samantha! I would use a tomato-based pasta sauce, like marinara, for the meatballs. The moisture of the sauce is great for the meatballs.